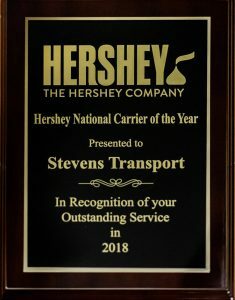 Stevens Transport is proud to announce the recent accomplishment of winning “Hershey National Carrier of the Year” for 2018. According to The Hershey Company, Stevens Transport exceeded satisfactory expectations while providing unparalleled solutions and service. The award is a prestigious honor that is highly respected in the industry, and Stevens Transport is thrilled to be recognized for our dedication to excellence.